Welcome to the Clean Water Team! Thanks for your interest in the City of LA's Team Effort! Together, we are all working towards cleaner neighborhoods and beaches. Please click here to visit our new and improved LA Team Effort blog! LA Team Effort Launches a New Blog! LA Team Effort has transitioned to a more advanced blog platform and will no longer be updating this site. So please check out our new and improved LA Team Effort blog! Low Impact Development Ordinance Meeting on November 4 at 1:30p.m. Please RSVP to lastormwater@lacity.org. We look forward to seeing you on November 4! P.S. If you'd like to get a refresher on what's happened with the LID ordinance, to date, please take a look at our LID blog posts. 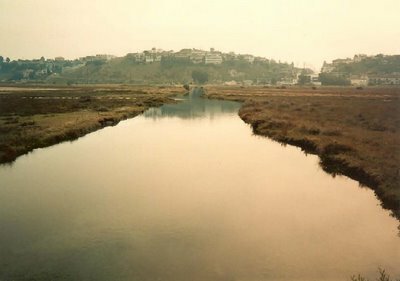 For nearly half a century, the North Atwater Creek has been all but forgotten. 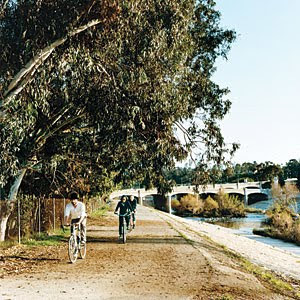 Set in the Glendale-Narrows portion of the Los Angeles River, this natural creek has become overgrown with non-native grasses and invasive exotic species such as the Mediterranean Castor oil plant. A man-made creek, the soil in its unstable banks is contaminated from decades of toxic runoff draining from an urban area. For decades, this polluted water has collected in stagnant pools at the base of the creek before being discharged into the LA River through four massive graffiti-ridden culverts. Not exactly the image of a creek that will lead the Los Angeles River revitalization effort – or is it? As the lead project for the City of Los Angeles’ proposed Los Angeles River Revitalization Master Plan, the restoration of North Atwater Creek and expansion of North Atwater Park perfectly embodies the objectives of Los Angeles’ renewal of the river and is a microcosm of what the City hopes to achieve up and down the LA River’s 51 miles in years to come. Funded in part by Proposition 50 and undertaken in connection with the settlement of two Clean Water Act enforcement actions (Santa Monica Baykeeper v. City of Los Angeles and United States, and the State of California ex Rel. 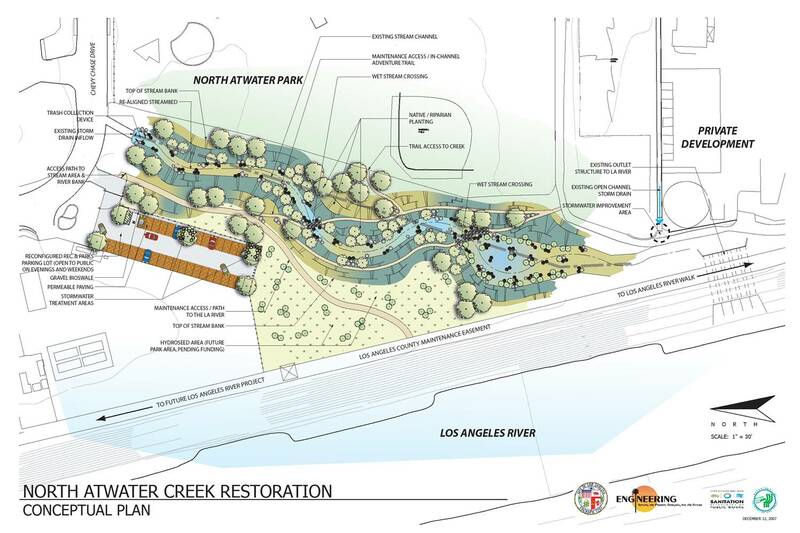 California Regional Water Quality Control Board, Los Angeles Region v. City of Los Angeles), the North Atwater Park Expansion and Creek Restoration project will use both structural and natural solutions to restore this natural creek and expand its park, simultaneously improving water quality and creating welcome green space for local residents and habitat for wildlife. Polluted runoff flowing from the 40 acres of urban residential neighborhoods north of the creek is a major concern and to address that ongoing issue, the City will install a capturing device at the top of the creek to intercept trash and bacteria. Another issue that plagues the water quality in North Atwater Creek is the horse waste from equestrian facilities adjacent to the site. The project will work to develop site plans to better address the proper disposal of horse manure. In addition to structural best management practices that will remove trash and bacteria, the project will also restore the creek and expand the adjacent park, which will improve the quality of life for both the local residents and native wildlife living close to North Atwater Creek. Birds like Black Phoebes and Blue Heron have always called the Los Angeles River their home and the renovation of North Atwater Creek, which will create additional habitat, will encourage these feathered friends to stop and rest a while along its banks. Likewise, the expansion of the park will encourage local residents to stop and enjoy the sights and sounds of North Atwater Creek. 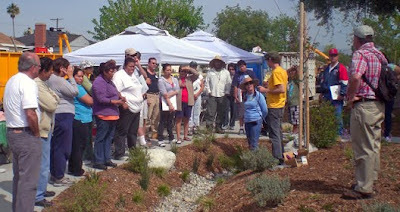 Recognizing that the renaissance of this creek provides the perfect opportunity to teach local residents about the Los Angeles River, watersheds and the manner in which structural best management practices and constructed wetlands work together here to improve water quality, the project will include an outdoor classroom gathering space and native demonstration garden providing educational opportunities. Interpretive signage dotting the park will further enhance visits by park goers. So, while North Atwater Creek may not have not received much attention over the last few decades, that’s about to change. This coming winter, construction crews will begin working on North Atwater Creek, and the City forecasts having this project finished within a year, by winter 2011. And, in the process, a forgotten creek will lead the way – towards cleaner water, increased habitat for native birds and wildlife, new educational and recreational opportunities for local residents and a renaissance for the Los Angeles River. Please join Councilman Tom LaBonge and officials from the Departments of Public Works, Recreation and Parks and Water and Power at the North Atwater Park Expansion and Creek Restoration Ground Breaking Ceremony, 2:00 p.m., Thursday, October 28, 2010, 3900 Chevy Chase Drive, Los Angeles, CA 90039. Shelly Backlar is the executive director of the not-for-profit Friends of the LA River (FoLAR), an advocacy group that promotes the restoration and revitalization of the river. She recently spoke with LA Stormwater about FoLAR and some of the issues they are currently tackling. When and why was the Friends of the LA River (FoLAR) founded? Friends of the Los Angeles River was founded back in 1986 as a 40-year Art Work to bring the Los Angeles River back to life. FoLAR’s founder, Lewis MacAdams and two friends, Patt Patterson and Roger Wong, cut the chain-link fence in downtown Los Angeles near First Street and walked upstream to the Arroyo Seco / Los Angeles River Confluence – the birthplace of Los Angeles. They decided that someone had to speak on behalf of the River and it would be them. Lewis envisioned the gospel tune, “Let’s All Gather at the River” as his inspiration for the organization. When he started he thought his job would be to convince people that the River had the potential to unite and inspire communities but he soon realized that he had to convince people that there IS a River in Los Angeles. Next year FoLAR will celebrate its 25th anniversary as the original voice of the River. Look how far we’ve come! What do you currently see as FoLAR’s biggest challenge? FoLAR’s biggest challenge right now is making sure that we continue to increase our organizational capacity to accomplish everything we want to accomplish with a very small staff. A lot of our success can be attributed to collaborating with other like-minded organizations as we did with the campaigns to transform both the Cornfield and Taylor Yard into state parks – Los Angeles State Historic and Rio de Los Angeles State Parks. We also work very closely with the Los Angeles Conservation Corps’ L.A. River Keepers to implement our outdoor education program, River School, as well as our Great Los Angeles River CleanUp, La Gran Limpieza. We are getting better and better at fundraising, securing grants for programmatic expenses, but can always use general operating funds to keep us moving forward in more and more creative ways. How about its biggest success? FoLAR’s biggest success is reflected in the number of stakeholders that are working to make the River and its watershed a better place for us all. The fact that Los Angeles County adopted its Los Angeles River Master Plan back in the ‘90s paved the way for improvements along the River from pocket parks to the Dominguez Gap Wetlands project. The City of Long Beach adopted a vision plan for the River, the Los Angeles River Revitalization Master Plan focuses on a vision for transforming the 32 miles of River within Los Angeles’ jurisdiction and groups like Save L.A. River Open Space are developing plans for restoring wetland habitat in communities like Studio City. Most recently when Lisa Jackson, the EPA’s Administrative Deputy, announced that the Los Angeles River is “a traditionally navigable waterway” she also said "A clean, vibrant L.A. River system can help revitalize struggling communities, promoting growth and jobs for residents of Los Angeles. We want the L.A. River to demonstrate how urban waterways across the country can serve as assets in building stronger neighborhoods, attracting new businesses and creating new jobs." This is what FoLAR and others have echoed for years so to hear the head of the EPA say these words with such enthusiasm, it made me realize that anything is possible. If you could tell people in LA two things about how they can best help protect and improve the LA River, what would those be? When it comes to protecting and improving the Los Angeles River I would ask people to think about the things they do on a daily basis and how their actions can affect the River. For example, if you walk your dog make sure that you pick up after him or her. Animal waste is a source of bacteria and if it washes into the storm drains, through the River and out into the ocean it can cause disease. You can cut down on the number of plastic bags that end up in our neighborhoods and waterways by bringing reusable bags to the market with you and, if you use a plastic water bottle make sure that you recycle it. Little things like that go a long way to keeping the River and ocean ecosystems cleaner and healthier. What kind of wildlife will you find in and along the LA River? The Los Angeles River is teeming with bird life and I always feel like a little girl when I spot a great blue heron or an egret or even an osprey. While one would expect to see more birds in the natural-bottom portions of the River, shorebirds can be found along the concrete sections where algae provides a food source. In addition to several different bird species the River also has several fish species such as tilapia, catfish and carp that can be seen spawning at the end of March and early April. You can also see turtles, crawfish, coyotes, raccoons, bullfrogs and even an occasional mountain lion near Griffith Park. I love being out on the River listening to the water, seeing the birds and knowing that all of this exists in our urban environment. Being able to share the River with people of all ages is such a thrill. I also really enjoy speaking to groups of all ages about the River’s past, present and future. It is so exciting to think about being able to fish and kayak and even swim in the River. That’s what FoLAR is working for, a swimmable, fishable, boatable Los Angeles River. Shelly Backlar joined Friends of the Los Angeles River as the Executive Director in 2003. As a member of the Los Angeles River Plastics Industry Task Force, initiated by Ad-Hoc Los Angeles River Committee Chair Ed Reyes, she collaborated with executives and city staff to ensure that plastic bags and fast-food waste do not wind up in the River. Shelly is one of 32 people asked by Councilmember Reyes to join an Advisory Committee to provide review, critique and advice to the City’s Los Angeles River Revitalization Master Plan. Shelly is a member of the Citizen’s Advisory Committee for the Sixth Street Viaduct Seismic Retrofit project, and an Advisory Committee Member for the Los Angeles and San Gabriel Rivers Watershed Council. She was just invited to join the Recycled Water Advisory Group, convened by the Department of Water and Power and the Bureau of Sanitation. Shelly speaks frequently at conferences, with the media and with myriad others about FoLAR’s vision and the issues affecting the future of the Los Angeles River. *Photo courtesy of the LA Times. We all know what it is, where it is and most of us even know what it does. It’s in the background of our city, but in many ways it’s the heart of LA. It flows through our communities and to the ocean we all enjoy and love. It’s none other than the Los Angeles River. So what do we really know about the river aside from it being a concrete channel leading runoff to the ocean? Below is a handful of fun and interesting tidbits we thought you’d enjoy. 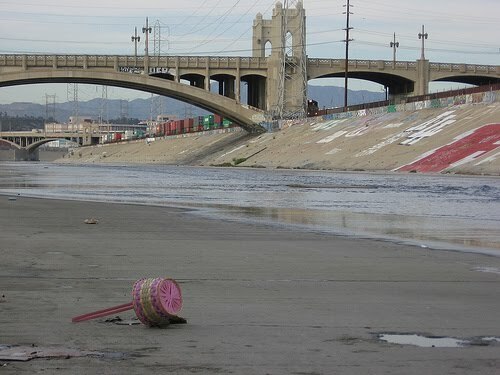 What has been your experience with the LA River? Non-existent? Fond? Mixed? Let us know by scribbling your thoughts below and sharing your pics on our Facebook page. (5) "2008 Los Angeles River Fish Study". Friends of the Los Angeles River. www.folar.org. The USC Wrigley Institute for Environmental Studies and Quiksilver, Inc have teamed up for a new science education program that is sure to make a splash! It is the QuikScience Challenge 2011 and is described as a multi-faceted competition for student teams to spark their interest in science and the ocean. The Challenge will also foster leadership, environmental awareness and stewardship. There are two Challenges, one for middle school teams as well as one for high school teams. 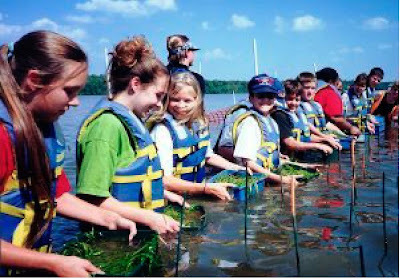 QuikScience Challenge projects will include an ocean science lesson, a community service project, a solution to an environmental problem, a portfolio and a creative presentation of the team’s work. If you live in California or Hawaii you are eligible to enter the Challenge. First place winners will travel to USC Wrigley Marine Science Center on Catalina Island for an entire week for education and fun! Second place teams will receive a 4 day trip to the same location. But every team is a winner with many prizes and drawings for all. Who knew science education could be so much fun? Registration ends October 29, 2010. For more information, please visit the QuckScience Challenge site. 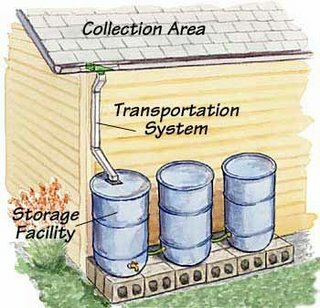 Are you thinking about installing rain barrels around your house? Or do you just want to learn more about rainwater harvesting, like how to reuse the water or a few safety tips? Well, the City of Los Angeles, along with the Cities of Pasadena and Santa Monica are having a few events that are right for you! To be presented at the Santa Monica Rainwater Fair on Sunday, October 17, the American Rainwater Catchment Systems Association (ARCSA) will be hosting a one-day course on general rainwater harvesting. The session will provide an overview of rainwater harvesting history, methods of applications, including concepts and techniques for uses such as landscape irrigation and wildlife management. This event will be free of charge. If you are busy on Sunday, there are also two advanced rainwater harvesting events (at a cost of $295 per workshop) to be held on October 18 & 19 by ARCSA at the Santa Monica Library. These courses will provide more in depth harvesting design and installation tips, out-door and in-home rainwater use ideas, as well as rules, regulations and much more! Monthly Events: Be an Eco-Champion this October! The heat wave is behind us. That means one less excuse for not getting out into the sunshine for a day of eco volunteering. Below are a few great opportunities to build community and help make our city a bit more green. >On Thursday, October 7th, come out to Park Work Day in Beverly Hills where Tree People and volunteers will be getting rid of unwanted, invasive plants as well as working to reduce slopes from erosion at an area park. >Saturday, October 9th will also prove to be a great day for volunteering. 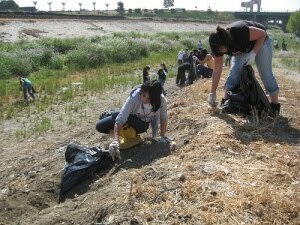 There are a number of community cleanups and restoration events taking place around the area, from Santa Monica Bay Keeper, Friends of Ballona Wetlands, City of Los Angeles, to name just three. >On Wednesday, October 13th the Los Angeles and San Gabriel Rivers Watershed Council's will be hosting a Wildland Weed Strategic Approaches Field Course, where you will get the skinny on all the good ways to get rid of bad weeds. >Have plans for Saturday, October 16th? Well now you do! Heal the Bay will be in Venice ensuring that the beach is known for its great sand and not trash. Come out to pitch a hand. >On Sunday, October 17th, the American Rainwater Catchment Systems Association will be in Santa Monica holding a seminar on all things rainwater. >Tree People will be at it again on Sunday, October 23rd in West LA for a little planting. Volunteers needed, the more the merrier (and the more trees that will be put into the ground). >The last 3 days of October will prove to be awesome with the Eco Maya Festival where ecological education, culture and health will be the focus. The event will take place at Los Angeles City College. Do you plan on attending any of the upcoming cleanups or events? Which cleanups or events will you be checking out this month? Also, be sure to check out a complete list of October’s upcoming events. Who among us hasn’t experienced the joy of planting a seed, nurturing the seedling and proudly watching it blossom into a young tree or flowering shrub. And so it goes with ideas. An idea is planted, nurtured and supported, and in time, that idea grows into a movement that positively changes lives and neighborhoods. The City’s Stormwater Program is undergoing a similar transformation with new ideas for how to responsibly manage rain flows at the neighborhood level. So come join us as we unveil one of these projects that embody this new vision and approach. The Elysian Valley’s Riverdale Green Street Project will celebrate its recent completion on Wednesday, September 29 with a ribbon cutting, and you are invited! For more information on the time and location of the event, click here for a downloadable flyer. For decades, runoff from storms was viewed as a liability; a community danger that needed to be diverted to storm drains as quickly as possible to avoid flooding and damage. Sadly, the runoff was often times contaminated with a wide array of pollutants ranging from pet waste to trash to used motor oil, and this runoff flowed untreated through our creeks and rivers, sending a toxic stew to area beaches. Now, in this era of mandatory water conservation and economic challenges, the idea of rethinking the management of rainwater and using that water for irrigation purposes or infiltrating it back into diminishing ground water supplies is taking root. And with that new way of thinking, came the Riverdale Avenue Green Street Project. Following in the footsteps of Oros Green Street and Elmer Avenue Green Street, this pilot project seeks to plant the seeds for a greener LA by creating a new green street standard here in the southland. The Riverdale Green Street Project, initiated by the City of Los Angeles and whose major funding source is the California Coastal Conservancy, utilizes stormwater parkway planters to treat and infiltrate polluted urban runoff. Completed in early August 2010, the primary goal of this project is to create a model for a new standard of residential street design. 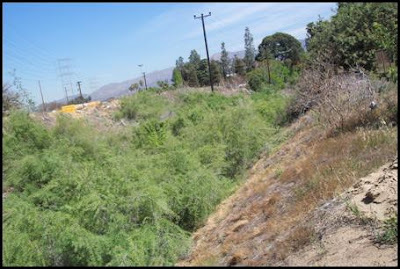 The project retrofited the existing parkways on both sides of Riverdale Avenue, between Crystal Street and its terminus at the west side of the Los Angeles River, with infiltration units that will capture and treat stormwater runoff from 14 acres of residential land. Parkway landscaping featuring drought-tolerant natives will be planted above these buried devices. This new way of constructing city streets and parkways will serve the dual purpose of treating contaminated urban runoff while simultaneously irrigating the parkway vegetation. Lauded by the environmental community and residents alike, this project will provide improved water quality in the Los Angeles River and, ultimately, San Pedro Bay. The City plans to monitor the quality of water flowing into the LA River from this project with the hope that it will provide a very real model in developing sustainable standards for future street design. So join us on celebrating the Riverdale Green Street’s completion. It’s literally a road to a green future. All across America, the idea of “going green” has taken off. Everywhere people are beginning to understand that our day-to-day actions have had a cumulative impact on Earth. And, with that understanding comes the desire to reduce that effect with a greener lifestyle. “Green” has become the new gold standard for how we live our lives to ensure the future health and sustainability of our world. It won’t be too long before the term “green streets” will join the ranks of household ideas promoting environmental consciousness. When we speak of “green streets,” some may think that we’re talking about ripping up streets and reverting back to the days of dusty country roads. Here in LA, the second largest city in the US, we’ll never be able to go back to those days of yesteryear. Instead, the term “green streets” refers to a new way of thinking, a new and sustainable way of constructing streets to promote the management of polluted stormwater runoff. Two streets in the Elysian Valley community are paving the way towards creating a new green streets standard here in LA. 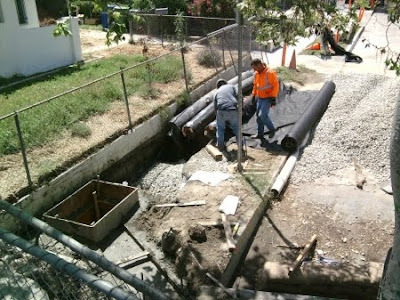 Three years ago, the City of Los Angeles and community group North East Trees partnered together to build the Oros Green Street Project with funding from the California Water Quality Control Board and Proposition O, LA’s Clean Water Bond. Using cutting edge technology, this model project constructed five stormwater gardens in Oros Street’s parkway to capture and infiltrate storm water runoff. Today, this project continues to demonstrate that green streets will help Los Angeles reach its goal of reducing pollutants in our local rivers, creeks, lakes and beaches. The Oros Green Street Project proved that stormwater management within our city streets was possible. The next project – the Riverdale Avenue Green Street Project – works towards establishing the City standard. 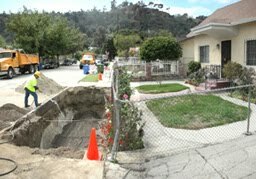 The Riverdale Avenue Green Street pilot project, initiated by the City of Los Angeles and whose major funding source is the California Coastal Conservancy, utilizes stormwater parkway planters to treat and infiltrate polluted urban runoff. Completed in early August 2010, the primary goal of this project is to create a model for a new standard of residential street design. The project retrofits the existing parkways on both sides of Riverdale Avenue, between Crystal Street and its terminus at the south side of the Los Angeles River, with infiltration units that will capture and treat stormwater runoff from 14 acres of residential land. Parkway landscaping featuring drought-tolerant natives will be planted above these buried devices. This new way of constructing city streets and parkways will serve the dual purpose of treating contaminated urban runoff and simultaneously irrigate the parkway vegetation. Lauded by the environmental community and residents alike, this project will provide improved water quality in the Los Angeles River and, ultimately, San Pedro Bay. The City plans to monitor the quality of water flowing into the LA River from this project with the hope that this demonstration project will provide a very real model in developing sustainable standards for future street design. Since the beginning of time, roads have provided humanity with a means to get to a new destination. It’s appropriate then that green streets are providing Angelenos with cleaner communities and water ways – paving the way towards a more sustainable future for all of Los Angeles. Countdown to California Coastal Cleanup Day! 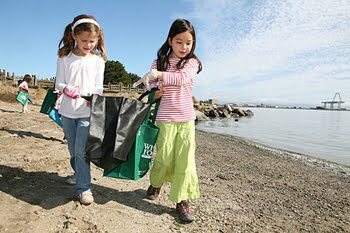 On Saturday September 25, 2010 the 26th Annual Coastal Cleanup Day will be held across California. Last year’s turn out for the largest marine environment event in the country was enormous here in the Golden State. Over 80,600 great volunteers collected over 1.3 million pounds of trash and recyclables. This year promises to be just as successful! California Coastal Cleanup Day is made possible by the California Coastal Commission's Adopt-A-Beach program. From 9 a.m. to Noon this coming Saturday, volunteers will be congregating at over 50 locations in LA County alone. And it’s not too late to join in the cause to pick up unwanted litter before it makes its way into our waterways! Heal the Bay along with the Los Angeles County Department of Beaches and Harbors are the LA County coordinators for the cleanup events. Check out Heal the Bay’s webpage to find a location near you and help make 2010 as successful as 2009. The ocean will thank you! Stormwater Partner Earns Pioneer Woman of the Year! 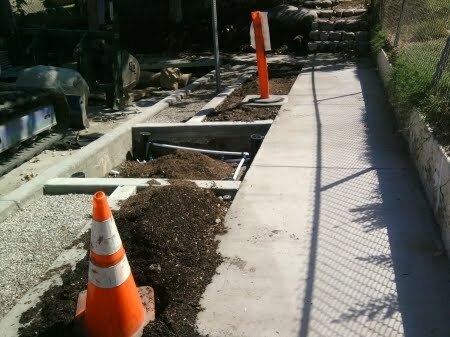 The City of Los Angeles Stormwater Program would not be successful if it weren’t for our gracious, committed partners. Our work’s outcome is enhanced due to the amount of talent and knowledge we are privileged to work with every single day. That’s why we are pleased to announce that Sherri Akers, a community environmental advocate and supporter of the Stormwater Program who lives in Mar Vista, was recently awarded the 2010 Pioneer Woman of the Year in Council District 11 by Los Angeles City Councilman Bill Rosendahl. To read more about Sherri’s great work and the award she worked so hard to earn, please check out this great piece in The Argonaut. The Stormwater Program congratulates you Sherri Akers! The City of Los Angeles Stormwater Program, on behalf of the Ballona Creek watershed, invites you to participate in the third workshop for the development of Total Maximum Daily Loads (TMDL) Implementation Plans for the Ballona Creek watershed on Tuesday, September 21st. The two previous workshops discussed the identification and prioritization of pollutant hotspots and opportunities for water quality improvement projects in the Ballona Creek watershed. With your great input, this resulted in two Implementation Plans for the Ballona Creek Bacteria and Metals TMDLs. The third workshop will be dedicated to the development of the third Implementation Plan for the Ballona Estuary Toxics TMDL. In addition, Stormwater Program staff will present preliminary concepts of several stormwater projects identified in the Implementation Plans. We look forward to meeting with you at this workshop! For more information and to RSVP, please contact Ida Meisami at Ida.Meisami.Fard@lacity.org or (213) 485-3999 with your name and the names of any additional guests. Sun Valley Stormwater Tour Wants You! 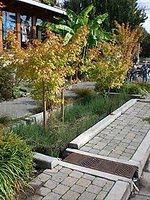 Want to check out some of the area’s most advanced stormwater projects? This month you are invited to come out to Sun Valley where the City of LA Department of Public Works and the Prop O Citizens Advisory Committee will take you on a tour of three fantastic sites (Strathern Wetlands Park, the Sun Valley Multi-Use Facility and Elmer Avenue Green Street). Please RSVP by September 10th. For more information, please email BPW.PAO@lacity.org, or call (213) 978-0333. When: Sept. 15, Wednesday, 10 a.m. Monthly Events: Kick-start Fall with a Little Community Building! What better way to welcome the change in seasons than with a volunteer or community event this month? If you didn’t have a chance to lend a hand for the environment this past summer, it’s not too late to jump right in to help green L.A. this fall. And if you did volunteer, we’re sure you are all rested up and ready to go again! Here’s a taste of what’s in store for September! >On Saturday, September 4th, come on out to Santa Monica where Surfrider will be hosting a beach clean up. Some fun in the sun is always great, just be sure to bring that sunscreen! >Saturday, September 11th is packed full of green goodness. Two tree care projects spearheaded by TreePeople will be taking place in Altadena and El Monte. There will also be a fabulously fun Environmentalist rendezvous including a picnic and film in Pasadena. >It’s not exactly a volunteer event, but that’s okay, it’s still great for the community. On Sunday, September 12th LA Streets Blog will be closing down streets in L.A. for a cool street fair. Bring bikes, skateboards or just your walking shoes. No cars allowed! >Do you like the famous Santa Monica Pier? How about pets? Well, there will be a great pet festival hosted by Best Friends on Sunday, September 19th, at the Santa Monica Pier. The event is being held to help raise awareness for homeless pets in our area. >On September 19th, there will also be a cool street tree care event in Mid City organized by TreePeople, that is sure to be a hit! You won't want to miss it. >On Tuesday, September 21 the cities that make up the Ballona Creek watershed are holding a workshop with the City of L.A. at Hyperion Water Treatment to educate the public about cool stuff like water pollution and sustainable, green approaches to water quality improvements. You should come on out! >Saturday, September 25 will be a fun one. It is Coastal Clean Up Day! Do you know what that means? Well, we’ll tell you. Heal the Bay will be coordinating over 50 cleanup locations throughout L.A. County! Yep, that’s a lot and there is sure to be one near you. >Check out all of September’s events that aid stormwater by visiting our calendar at http://www.calendarwiz.com/calendars/calendar.php. And if you have any upcoming events, please send them on over to us and we will be happy to include them in our community calendar.